Manila, Philippines - Southwest monsoon (Habagat) is now affecting Luzon and Visayas areas, PAGASA said in the weather forecast, update issued at 5:00AM today, August 21, 2013. Meanwhile, at 4:00 am today, Bagyong “MARING ( Typhoon TRAMI) was estimated based on all available data at 500 km Northeast of Itbayat, Batanes (24.2ºN,125.9ºE) with maximum sustained winds of 105 kph near the center and gustiness of up to 135 kph. It is forecast to move West Northwest at 15 kph. Metro Manila, Ilocos region, Central Luzon, CALABARZON and the province of Benguet, Batanes and Babuyan group of islands will experience monsoon rains which may trigger flashfloods and landslides. Visayas, the rest of Luzon and the regions of Caraga and Davao will have cloudy skies with light to moderate rainshowers and thunderstorms. The rest of Mindanao will be partly cloudy to cloudy with isolated rainshowers or thunderstorms. The weather bureau also issued today at 4:30AM Yellow Rainfall advisory for Metro Manila areas. Under the heavy rainfall warning system, a yellow rainfall advisory is raised when the expected rainfall amount is between 7.5 mm and 15 mm within one hour and likely to continue. Communities given this advisory are advised to be aware of the weather condition and warned that flooding may be possible in low-lying areas. 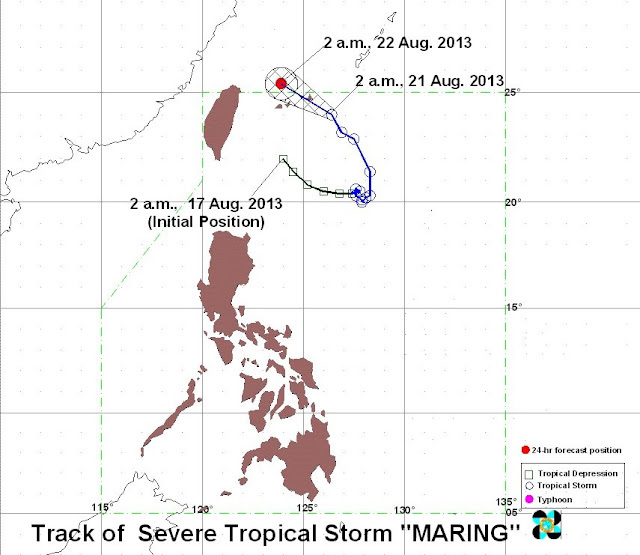 PAGASA, in its 11 p.m. advisory (August 20), also said Maring will continue to enhance the southwest monsoon "that will bring moderate to heavy rainshowers and thunderstorms over Luzon particularly over the western section." For more information and queries, log on to w.pagasa.dost.gov.ph or please call at telephone numbers 927-1335 and 927-2877. You may also check our weather updates on Twitter (@mysummitexpress) or via Facebook. Subscribe now to our RSS or E-mail List.